The language of Charaka is Sanskrit and its style is poetry, with meter and melody. Poetry was known to serve as a memory aid. For example, Charaka contains over 8,400 metrical verses, which are often committed to memory, in toto, by modern medical students of Ayurveda. It presents most of the theoretical edifice of Ayurveda and concentrates on the branch of Ayurveda called kayachikitsa (internal medicine). This is largely the theory of the internal fire-of digestion-or internal medicine, in modern terms. Charaka never discusses the sub-types of pitta and kapha, but does list and describe the 5 sub-types of vata. Seen from a greater perspective, this work seems to represent a certain value of consciousness that is different from other works. It gives more discussion about the notion that life is fundamentally a field of intelligence and pure knowledge. This field is self-aware; it is the Knower as well as the object of perception, and for Charaka this is part of what is to be treated by the physician. The P.V. Sharma translation comes in four volumes, two of original text and two of commentary about the original work. Sharma's English version is said to be a scholarly and relatively faithful work. It has numerous appendices and an extensive index. 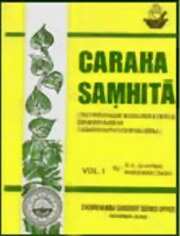 I am seeking about charaka samhitha ayurveda text books for medical students in shops and not satisfied.then I search through google and the site saw that the vedic books.net.yes i am satisfied.